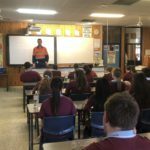 The first half of 2018 has been a hectic time for the Queensland Minerals and Energy Academy’s 46 schools. The QMEA, a partnership between the QRC and the Queensland Government under its Gateway to Industry Schools Program, has produced 65 events and engaged with more than 2,000 students and 236 teachers in the past six months.The $1 million per annum program to encourage students into science, technology, engineering and maths (STEM) and trade careers was also supported by 124 industry representatives who provided valuable mentoring to the students, guiding them onto STEM and trade pathways. 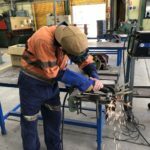 And, it’s paying dividends with Queensland Government statistics demonstrating that higher proportions of QMEA students end up in trade and STEM careers— as well as higher proportions of girls and Indigenous students— than in non-QMEA schools. We thank all our company sponsors who make this program possible. The video at the top of this page summarises the year’s activities to date. It’s the first time the QMEA has presented its mid-year update in video format.